Thanks, Susan. I’m glad the Stegner, Wharton and Ford struck a chord with you. I loved Slaves of Solitude and hope to read another by Hamilton (Hangover Square) later this year. I think we might have to agree to differ on Slaves, but I guess life would be very dull if we all liked the same things! Very welcome, Stu. Nada was a real find for me, and I doubt whether I’d have discovered it without the recommendations from bloggers. What a wide-ranging list, geographically and temporally. I’ve only read Days of Abandonment but hope to read My Brilliant Friend soon. I’m also a fan of Stegner as well as the House of Mirth. Thanks for so many interesting suggestions! You’re very welcome, Rebecca! Wallace Stegner’s great, isn’t he? I must read another by him at some stage, possibly Angle of Repose. I hope you enjoy My Brilliant Friend. The Sorrow of Angels is definitely worth a look. I don’t know if you’ve read Stefansson’s Heaven and Hell? Sorrows is the second book in the trilogy, and I was a little lost at the beginning as I hadn’t read the first one. Best to read them in order if you’re thinking of diving in. Thanks for the info, Jacqui: I will try to read the first book as well. Hope you have a good reading month. You’re very welcome, Rebecca. Likewise, may the next month and year ahead be filled with great books. I have the Infatuations here unread. The Ferrante books are really hugely popular here which always makes me suspicious. I heard from a friend that she loved the first one but considered the second ‘chick lit’. What do you think? I plan to read Crossing to Safety and Cassandra at the Wedding (the latter after reading your review), and I bought Where there’s Love There’s Hate after reading your review. The House of Mirth is wonderful–not my favourite Wharton which is The Custom of The Country. Transit made my best of list last year–phenomenal. I’ll be interested to hear what you think of The Infatuations. Have you read Marias before? I think we’re on safer ground with the Bioy Casares/Ocampo novella as I’m fairly sure you’ll enjoy that one. I have high hopes for Cassandra too as she’s such an intriguing and complex character. Moving to Wharton, I have Custom of the Country to look forward to and I know Emma loved it as well so that’s a banker. Transit is exceptional, and I’m glad you think so too. It deserves to be better known. Thank you! Likewise, I’m looking forward to reading your reviews. It’s always good to see what other bloggers are enjoying. It’s an impressive list, and I envy how many translated books you have there. It’s going to be one of my 2015 goals to read more translated books, as well as read more in the original languages (PT, ES, FR). Thank you. I tried to read a broad range of books in 2014 — a decent mix by male and female authors, translations alongside books in the English language, a range of styles — but it can be challenging to juggle everything. Best of luck with your reading aims for 2015, and I hope this list might give you a few ideas. Lovely selection! I’ve only read H is for Hawk from your list, but I really enjoyed it. Many others are lurking in my TBR – especially the Ferrante. I hope I enjoy them as much as you did. Have a wonderful 2015! Thanks, Jackie. I’m really glad you enjoyed H is for Hawk – it’s one of those books that seems to have resonated with so many people and it’s great to see it getting the recognition it deserves. Another prize last night! I hope you enjoy Ferrante’s novels. Wishing you all the best for 2015, too. Great choices Jacqui ….i am a big Marias fan . Have you read A Heart So White that is my abs fave . I’m so glad Nada made it into your list. And I remember your fabulous review of Cassandra at the Wedding. I couldn’t forget Nada – it’s one of the books that has stayed with me during the year. Such a brilliant novel for a debut and to think Laforet was only twenty-three at the time. Amazing. Thanks for your kind words about my Cassandra review. Some great Spanish authors in your list, Jacqui. Thanks, Jose. I seem to have a good hit rate with Spanish writers so you can expect to see a few more in 2015. Interesting list, Jacqui. So many there I need to have a look at. Thanks for highlighting them. Thanks, Naomi. That’s good to hear. I know you’re about to start the #TBR20 (with a twist!) so I hope you’ll have a chance to investigate one or two once you return to book buying. This is a wonderful list – Stegner is already on my all-time top 10, and I also enjoyed The Good Soldier and Slaves of Solitude but there are several I’ve got lined up to read, including H is for Hawk and Cassandra At the Wedding. Never Any End to Paris is so up my street I’ve put it on my wishlist immediately, and there are many others I’d like to check out too! Thanks, Victoria. Wallace Stegner is great, a real discovery for me and I must read more by him (and Patrick Hamilton, too). I might try Angle of Repose as my next Stegner. Jacqui – what an enticing list, a handful of which I’ve read, with another few – Nada, Transit and The Good Soldier – already on my list of works to read this year. You were instrumental in providing the final push for me to start Ferrante’s trilogy. I’m nearing the end of the first volume and liking it far more than the brutal, claustrophobic Days of Abandonment. I obviously can’t yet speak for the ensuing volumes, but I’ll address Guy’s concern by noting that while the books have received enormous attention for their treatment of friendship between women, I’m finding My Brilliant Friend equally interesting for its treatment of Naples itself. Ferrante seems in part to be attempting nothing less than an exorcism of all the forces that have kept that astonishing city eating itself. There’s also a fascinating (though somewhat frugal) realism to the novel that has me currently working out on a map the location of Elena and Lila’s neighborhood and tracing their travels around it. Another reader I know (reading the trilogy in the original Italian) has produced a clever and quite beautiful chart of the relationships and intermingling between the families. If I can get his permission, I’ll try to post it should I get around to writing about the books. I’m eager to see what you’ll be tackling in 2015. Scott, thank you so much for your comments. I’m delighted to learn that Nada, Transit and The Good Soldier have already secured their places on your 2015 reading list, and I can’t wait to hear what you think of them. I’m also thrilled (and relieved) to hear that you’re enjoying My Brilliant Friend, the first of Ferrante’s Neapolitan novels – now a tetralogy! I recall our discussion on whether these books stretch their legs and walk the streets of Naples (I think they do), and it sounds as if Ferrante’s evocation of this city had captured your interest too. You’re absolutely right, she does expose the terrifying forces at play in the neighbourhood: the control exerted by key players (Don Achille and the Solara brothers); the sudden eruptions of violence and abuse against women. It’s all there. These forces and tensions do carry through to the second volume, but there’s a section where the action moves to Ischia and the focus shifts to Elena (this is the bit I mentioned in my reply’s to Guy’s concerns). While there’s still much to enjoy here (including two or three key scenes), this mid-section is quite long. Having said that, the narrative arc as a whole is very compelling, and the final quarter of book two pulls things right back on track and moves the story into new territory. Your map sounds fascinating, as does your friend’s chart on the relationships between the families. Such intermingling, and there’s more of that to look forward to in book two! I do hope you’ll find some time to write about these books as I for one would love to read your post(s), and I’m sure others would too. As for 2015, I’ll definitely be reading Joan Didion (inspired by posts from Emma and Max). I can see Wharton, Penelope Fitzgerald and Patrick Hamilton featuring again, and I must get cracking on Eric Ambler – I have Topkapi, The Light of Day. 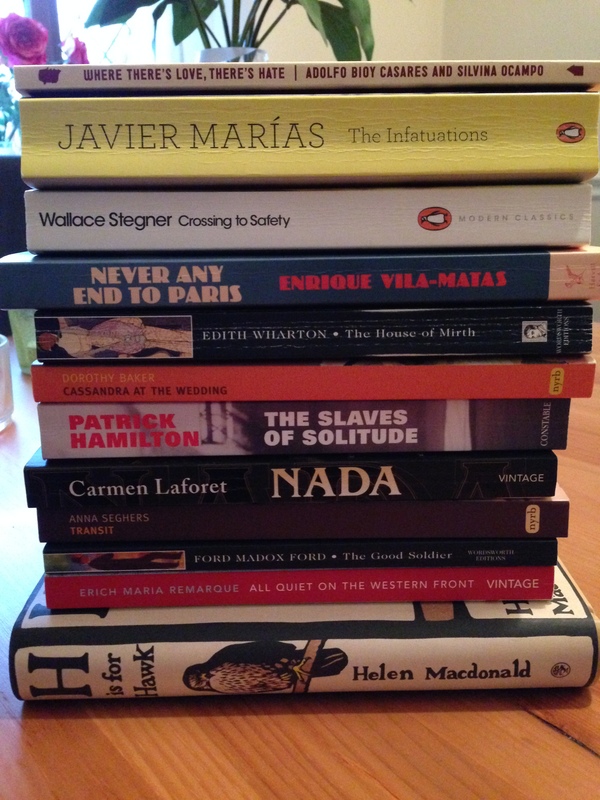 Oh, and a few Spanish and Italian books too – I can’t seem to get enough of those. How about you? Are you planning to do an end-of-year round-up post? I’d love to hear more about the books on your list. Your blog was one of my discoveries of 2014. I do hope we might be treated to a peek at Scott’s map and that relationship chart his friend has compiled! Let’s hope so. A great list, Jacqui – I’ve definitely got a few more books to add to my to-read list! I finished reading H is for Hawk yesterday and I completely agree with what you’ve written here. Helen Macdonald’s writing is simply excellent. I was so glad to hear of her Costa award win last night. Many thanks, Gemma. ‘H is for Hawk’ is wonderful, isn’t it? Likewise, I was delighted to hear of its win at the Costas. I think the main prize might come down to a choice between the Macdonald and Ali Smith’s How to be Both, which I still need to read. I was hoping to sink into it over Christmas, but that didn’t quite come off! I hope you enjoy How to be Both if you do get round to reading it! Would love to know what you think. Thanks, Gemma. It’s in the pile and I hope to get to it soon. Cassandra’s great, Ali, and I think you’d like Dorothy Baker. A wonderful list, Jacqui — I can’t believe you’ve only been blogging for 8 months, it feels like you’ve been here forever! I mean that in a good way — you read such interesting stuff and it’s nice to come to a blog that doesn’t focus on the new, new, new all the time. I have Crossing to Safety, The Slaves of Solitude & H is for Hawk on my TBR so your praise for them means I really must read them sooner rather than later. Hope 2015 is a wonderful reading year for you! Many thanks, Kim. Haha! Yes, it does feel as if I’ve been here for a while, but my first post went up at the beginning of May. I’ve been tweeting and reading blogs for a few years though, and I guess that’s why it feels as if I’ve been around for a bit. Oh, I hope you enjoy Crossing, Slaves and H is for Hawk – all three seem to have resonated with other bloggers / tweeters too. I hope 2015 brings you lots of wonderful books, and I’m looking forward to reading your reviews. Mary Costello’s Academy Street is definitely on my list for this year. This is a list of books that looks to be very worthy. I have only read House of Mirth and I agree that it is worthy of any year end best of list. I want to read many of these books myself. I hope to get to All Quite on The Western Front at the very least within the next year. I loved House of Mirth, and it sounds as if I can look forward to a couple of others by Wharton as I still have The Age of Innocence and Custom of County to come. I can thoroughly recommend All Quiet on the Western Front, and I hope you get a chance to read it this year. Wishing you all the best for 2015, too! Jaqui, I’m currently in the second of the Neopolitan novels, and LOVING it/them. I purchased the third on my kindle, absolutely unable to wait for library timing. Without you, I would not have picked My Brilliant Friend up again (why did it not sit with me the first try through? Can’t figure that out! ), and so I thank you so much for your stellar reviews and recommendations. I’m so happy that you chose to write your own blog in 2014. While it was wonderful to email each other, and to grab a tweet here and there (on my part, you’re excellent at Twitter) it is a joy to visit you here at your own “home”. We share a deep affection for so many things. Fabulous! I am so glad you took a chance on returning to My Brilliant Friend, and it’s great to hear that you’re loving volume two so far. Now I’m wondering where you are in the second book and how you think it compares with the first. I’d love to know once you’ve reached the end. Perhaps it just wasn’t the right time for you when you picked it up before? I can think of a few books that I’ve started and then put aside after 30 or 40 pages simply because I wasn’t in the right frame of mind or mood at the time. I had two false starts with David Mitchell’s Thousand Autumns only for everything to click into place on the third attempt. Somehow I just knew I’d end up loving it (and that’s what happened). Thank you so much for your encouragement and support in helping me to start my own blog, Bellezza – I’ll always remember that. Your recommendations have made their mark on my reading too. I bought The Tunnel off the back of your review, and Barcelona Shadows is in my TBR so I must get around to that this year (the TBR is king at the moment). It was wonderful to read The Infatuations with you and I can recall our discussions about Marias’s writing, how those passages spoke to both of us (the ones on Luisa’s grief following the death of her husband). As you say, we share an affection for many things in life and literature. Looking forward to many more conversations in 2015 – wishing you all the best for the year ahead. Many thanks, Karen. I hope you’ll be able to find the right moment to try again with The Infatuations. I love Marias’s writing, but his long looping sentences and digressive style may not suit every reader! Likewise, I always enjoy reading your reviews and love the diversity of the books you pick. I’m very glad to have discovered your blog last year – wishing you all the best for the year ahead. You too Jacqui – here’s to a good year of reading! A great selection. It’s good to see so many older books there – I sometimes worry that book blogging can become all about the latest thing. That’s not so bad for someone of my age who began reading well before the internet and has therefore read a fairly good spread of classics (and still, wants to read more) but will younger generations feel too much pressure to always absorb the new? And congratulations on your blog (hard to believe it’s not been around forever) – which is something of a hub for bloggers! Thank you, Grant! It does feel as if I’ve been here for a while – my IFFP guest posts started back in March, so if we count those reviews it’s probably closer to ten months. I probably ought to read a few more new books although these days I find myself increasingly drawn towards the older ones: classic novels I’ve missed, great authors I’ve yet to try and the like. There are so many gaps in my reading I could happily spend the next few years reading backlist titles alone but then I’d be missing out on some excellent new books. I can understand the attraction and buzz around the latest releases, but I guess each reader/blogger needs to settle into a mix of books that works for them. I love the range of stuff you cover on your blog – you read such interesting books, several translations from some of my favourite publishers (Pushkin Press, Peirene et al.). I have the Teffi and Fraile story collections to look forward to and hope to include one in my #TBR20! Looking forward to seeing what you discover in 2015, all the best for the year ahead. I’ve only read two of these AQOTWF and The Good Soldier) although I hope to remedy that in the coming year/s. I certainly want to read the Marias – I’ve only read a couple of his shorter works to date. Wharton is another writer I have on my shelves waiting for me to find time for them and I also have a book by Patrick Hamilton which I fully intend to read in 2015. Looking forward to another year of tracking your reading. May it be a good one! Thanks, Seamus. I don’t think I’ll ever forget All Quiet, one of those books that seems to have touched so many people. The Infatuations is great, and I think there’s a good chance you’ll like it as there are parallels with The Sound of Things Falling (I have fond memories of your review of that one). You have a treat in store with Wharton that’s for sure and Hamilton too if The Slaves of Solitude is anything to go by. Likewise, I’m looking forward to following your reviews in the year ahead. For starters, I’m very keen to hear what you think of Soseki’s The Gate, which I believe you’re reading for Tony’s January in Japan event. I thought I had a copy of it but can’t find it anywhere – perhaps it’s on a wishlist instead. Either way, I’m eager to hear more. All the best for 2015! Thanks, Tony. I’m sure it’ll bring many more books in translation. Wishing you all the best for 2015 – I hope to start a Japanese book at the weekend! A wonderful mix of familiar and unfamiliar Jacqui and so many great recommendations I feel excited for 2015 and all the excellent books there are to read, without even knowing what new titles might be published! Loved the Elena Ferrante novels and Nada and H is for Hawk, they all made my list too and would love to read another Edith Wharton this year, having read Ethan Frome and Summer in previous years and loved them. Can’t wait to see what you read this year, wow 101 is amazing! Bonne Continuation Jacqui and thanks for being such a supportive presence online. Many thanks, Claire – I love that we have Ferrante, Nada and H is for Hawk in common, and I hope one or two others might pique your interest. I discovered Nada through your wonderful review so thank you for that! Wharton’s great, isn’t she (Ethan Frome is a favourite of mine). I recall you saying that you were aiming to read a few of her other novels before making a start on the society ones. I loved House of Mirth and hope to read The Age of Innocence this year. I think there’s a strong chance that you’d love the Stefansson series. His prose is wonderful (lyrical, almost poetic in style) and the story engaging. Definitely worth a look. I doubt whether I’ll read 101 books this year (several novellas in that total) but let’s hope the next 12 months brings lots of wonderful books. Looking forward to following your reviews this year as I always enjoy reading your posts! Great list. Glad the Hamilton made it. I know I still owe my Ford writeup, currently I expect him to make my 2015 list (I finished it a couple of days into January. You’ve had a good year variety wise haven’t you? Translated fiction, classic fiction, the Macdonald, there’s real range there. Thanks, Max. The Hamilton was a shoo-in. I’ll have to read another this year: Hangover Square, I think. Looking forward to your Good Soldier review; it’s a book I’d like to reread one day. Just realised that you were talking about Helen Macdonald! I was tuning into the other Macdonald (probably because I associate you with Ross and the Lew Archer series). Even more diverse if we add noir/ hardboiled into the mix..
From the list I’ve only read Vila-Matas. The rest I would definitely look out for, especially the women writers (Ferrante, Laforet, …) who I’ve not been reading a lot lately. Ferrante has been the subject of much attention, but I think her writing holds up to the weight of expectation. She’s definitely worthy of investigation, and I’d be interested to hear your thoughts should you decide to give her a go. I loved Nada – the writing, the mood, the distinctive narrative. It’s a great debut. Thanks for dropping by, Rise – wishing you all the best for the year ahead. I thought Transit remarkable and can recall our discussion about the link to Casablanca (which I love). Yes, I wondered about Parade’s End although a couple of friends were disappointed by the quality of Ford’s writing in that one (especially in comparison with The Good Soldier). Have you read Parade’s End, and if so, what did you think? Does the prose hold up? Oh, that’s great, and I hope you enjoy any that you end up reading. I’m glad we found each other too! Thanks for dropping by. Great list thanks Jacqui, Nada and Where there’s love, there’s hate had passed me by but sound like my cup of tea. The House of Mirth and All Quiet are both brilliant books, I’d highly recommend Wharton and Remarque’s other work also. By the later, The Road Back is a fascinating look at compatriots of Paul’s trying to adjust to civilian life. You’re welcome! I can thoroughly recommend both Nada and Where There’s Love, There’s Hate. They’re very different books but excellent in their own way. I have another two by Wharton on my shelves and hope to read The Age of Innocence later this year. It’s great to hear that you rate Remarque’s The Road Back as I’d like to read it especially given the link to All Quiet. Wonderful list, Jacqui! I loved ‘All Quiet on the Western Front’. From your list, I want to read ‘Nada’ and ‘The House of Mirth’. I also love your description of the Wallace Stegner book. I will look for that too. It is such an interesting contrast when compared to the Ford Maddox Ford book. Hope you have a wonderful reading year in 2015! Thanks, Vishy. I was delighted to see All Quiet on your list, and I can’t believe it’s taken me so long to get around to reading it. Nada is fantastic, I can’t recommend it highly enough. It seems to capture a time, a place, a mood, a unique voice. I’m sure you’ll enjoy The House of Mirth – I have The Age of Innocence to look forward to later this year. Do take a look at Wallace Stegner as I think you’d love his prose; it’s beautiful, almost luminous in a way. Wishing you all the best for 2015, too. Belated thanks on your great reading year, Jacqui! I might give the Ferrante, that Vila-Matas and a couple of others a whirl later in the year, and of course I love the Laforet and Marías picks. Very nice to make the acquaintance of your blog last year, of course–please keep up the good (and enthusiastic) work! Very glad to have met you through your Spanish Lit Month extravaganza and I’ll be back for another fix later this year (and the Argentinian event too). Looking forward to seeing what you’ll be reading in 2015.